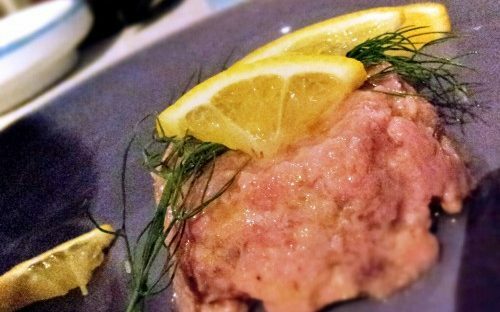 Tuna tartare: Tuna tartare is a very light and simple dish perfect as an antipasto. 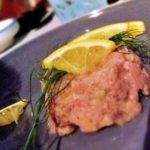 The essential ingredient is high quality, fresh tuna which isn’t too difficult to find on the tiny Italian island of Ponza.You can make different versions of Tuna tartare using orange or lime but however you chose to create it, it is best prepared an hour before you are ready to serve. In a small bowl, add the oil, orange juice, orange zest, fennel and salt then mix well. Pat the tuna as dry as possible with some paper towel. Chop the tuna as finely as possible then add it to the oil mixture. Mix well and spoon the tuna tartare into your choice of molds, pushing it down with the back of a spoon. 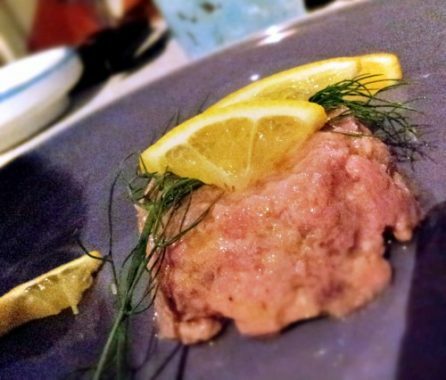 Turn the tuna tartare out onto serving dishes and decorate with fresh lemon slices and fresh sprigs of fennel.